Physical characteristics: The great blue turaco is regarded as one of the most beautiful birds in Africa. Its bill is yellow, with a red tip as if it's wearing lipstick. The bird's head is topped by a blue, almost black, crest. Plumage on the head, back, and wings is greenish blue. There is yellow on the chest and other areas including the tail, and red plumage above the feet. The great blues are the largest members of their family. Males measure from 28 to 30 inches (70 to 76 centimeters) and weigh from 1.9 to 2.1 pounds (0.9 to 1 kilograms). Females weigh from 1.8 to 2.7 pounds (0.8 to 1.2 kilograms). 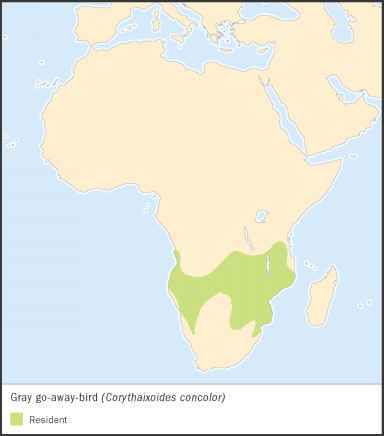 Geographic range: Great blue turacos live in Guinea, Sierra Leone, Ivory Coast, Ghana, Nigeria, Cameroon, Central African Republic, Sudan, Kenya, Gabon, Uganda, Equatorial Guinea, Rwanda, Democratic Republic of the Congo, and Burundi. Habitat: Turacos spend most of their days in the canopies or tops of trees in Africa's forests. Diet: Turacos mostly eat fruit, and they pluck it from trees or shrubs. When there is little fruit around, they eat leaves and flowers. Sometimes great blue turacos eat algae (AL-jee), tiny plants that grow in water. Behavior and reproduction: Great blue turacos are sociable and form parties, groups of up to eighteen birds. A party stakes out a territory of its own. They communicate with two types of calls. One is a low tone that has been compared to a purr. The other is harsher, and sounds like the word "cow" being repeated. Birds travel in parties and pairs. After mating, they make a nest resembling a platform out of sticks. The hen lays two blue-green eggs. 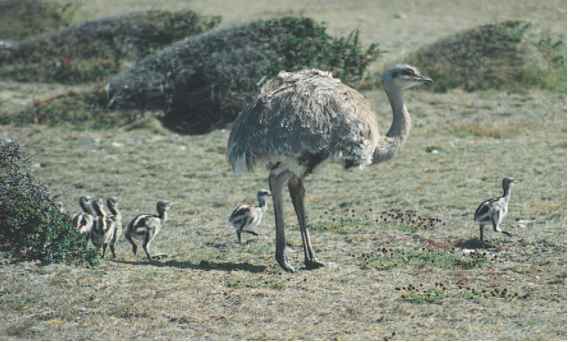 Both parents incubate the eggs, which hatch in twenty-nine to thirty-one days. In five to six weeks, hatchlings fledge, growing the feathers needed to fly. They will be cared for by their parents for about three months. Great blue turacos and people: Some people eat turaco meat.